Diwali is one of the most popular festivals of India and a huge share in that popularity is due to the bursting of fire crackers that forms an integral part of the celebrations. The festival is symbolic of the victory of light over darkness as sought in the prayer, Tamasoma Jyotirgamaya and the ascendance of enlightenment over ignorance. 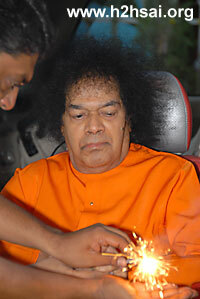 Puttaparthi has had a cherished history of Diwali where Swami would inaugurate a grand session of fireworks after a fiery discourse and the students would romp and celebrate with the crackers thereafter. Times have changed but not the spirit. The evening saw a full house Sai Kulwant Hall as everyone wanted to celebrate this festival of love and light with Bhagavan. As soon as Swami arrived in the hall at 4:55 p.m., He presented boxfuls of diyas or lamps to be distributed to all married women. 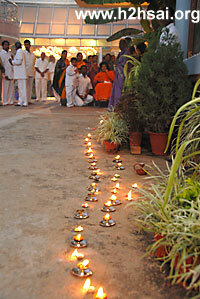 Immediately there were sparks of excitement and joy and everyone rushed towards the epicenter to receive silver lamps. Swami moved through the ladies and gents’ side. They were all brimming with joy as Swami moved slowly towards the stage. 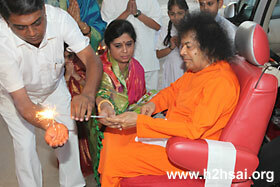 As usual there were cards galore which Swami quickly blessed. Reaching the stage, Swami sat for the bhajans. The week leading up to Diwali has been quiet, yet eventful. 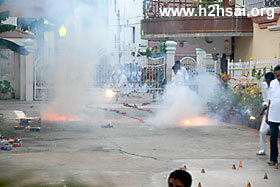 Everyday saw the arrival of Swami at around 4:30-5:00 to grant darshan. Thereafter, He sat for bhajans invariably till 6:00 p.m. with an occasional stretch. The creation of chains and showering of grace continued on a regular basis. And on that day, the people of Gujarat had flocked in large numbers to celebrate Diwali and the Gujarati New Year with Him. The programme these people had come prepared with did not materialize on that day as Swami sat serene on the stage allowing one and all to drink deep into His nectarine form. 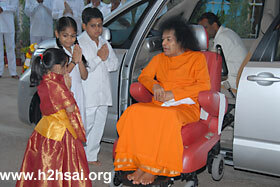 After a while, He blessed prasadam for distribution and received aarthi. 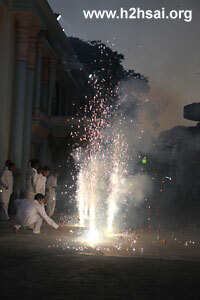 As He reached the Residence, the children from the 8th standard were ready to burst crackers. Some members of Swami's 'family' (that is to say, the family of His physical form!) 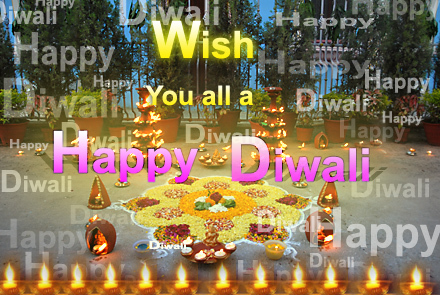 had also gathered as in the Bharatiya tradition, Diwali is celebrated with one's family. 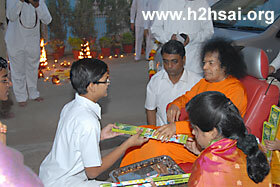 Swami blessed crackers and personally distributed them to the children. He lit the first sparkler to declare the festival open for the children to have a "blast". 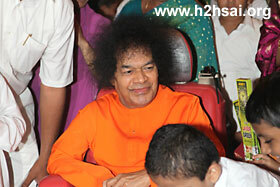 Swami then sat smilingly as the crackers were burst in His presence. 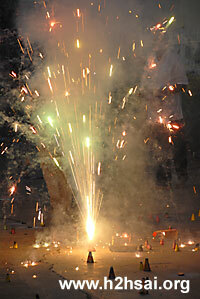 Flowerpots, garland crackers, and a plethora of skylight fireworks lighted the evening. Crowds gathered and later swelled at both the ends of the residence with the desire of catching a glimpse of that lovable form. Some of the children near Swami were in fact plugging their ears with their hands as they were fearful of the loud explosions. Swami smiled at this and seemed to reassure the children. Some of the fireworks let out a lot of smoke. Everyone was fanning theirself but not Swami. He seemed totally unaffected. Another lovely scene was when hundreds of moths and insects that seemed to have been alarmed by the sounds and smoke flew towards calmer settings. And thus it was that the walls beside Swami were studded with these little creatures of God. They too surely knew that when everything seemed to be chaotic, they would find peace and refuge in His presence, near Him! Swami saw the display for about fifteen minutes. Then, like a loving mother, He asked for soaps to be distributed to all the children so that they could wash themselves clean after the bursting session! 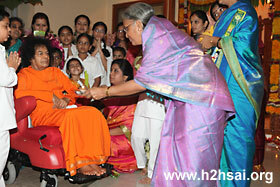 The soaps were thus distributed after which Swami blessed everyone and moved into the residence.